Axiom Propellers Ltd. requested the School of Marine Science and Technology (MAST) of Newcastle University to conduct open water model tests on a 300mm diameter, 3 bladed, Axiom propeller . The purpose of the test was to measure the performance and cavitation characteristics of the optimised Axiom design; the original propeller being tested in 2010 also in the Emerson Cavitation Tunnel. The 2010 study of the Axiom propeller included ahead motion (11 st quadrant), stopping in ahead motion (22nd quadrant), astern motion (33 rd quadrant) and stopping in astern motion (44th quadrant). However given the symmetrical nature of the Axiom propeller design only the first two quadrants were actually required , the latter two being skew symmetric.. In addition to the 2 quadrants tested,, the Axiom mark II propeller was tested for the effect of cavitation over a range of achievable advance coefficients.The report presents the description of the test set - up and gives the results of the open water performance tests at atmospheric condition including the first two quadrant data for this propeller. A short review of the cavitation observations in the 1 st and 2nd quadrant s is given as well as conclusions from the test. 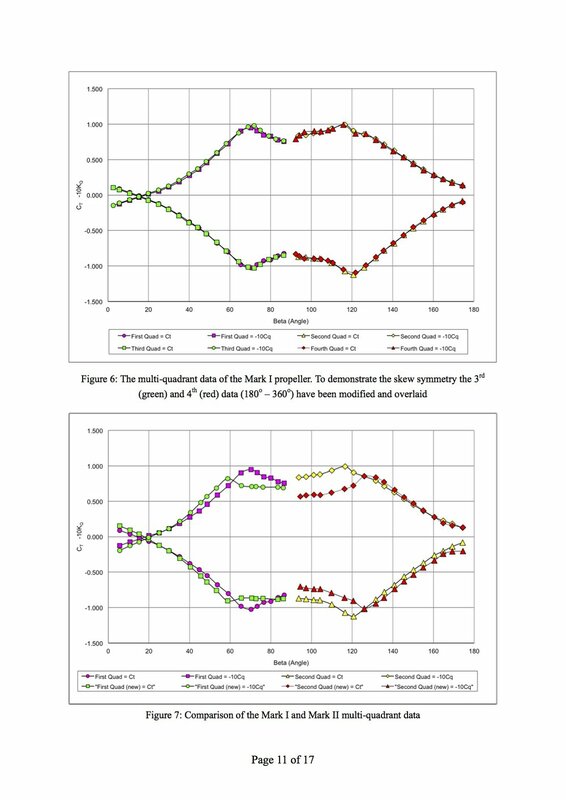 The data is given for thrust (KK T ) torque (110K Q ) efficiency ( η o ) for all of the experimental points gathered.. The data has been subsequently processed using least squares fit to give the backbone curves for each of these variable s.. The Mark II propeller provided very repeatable test data with only small test to test variation . The maximum efficiency was 53.7%% at J = 0.575, when this is compared to the Mark I propeller it is clear that the reduction in blade area and tapered blade out - line as opposed to the plan form (square shape)) between the two designs has had a significant positive effect on the efficiency. The multi - quadrant data of the Mark I propeller . 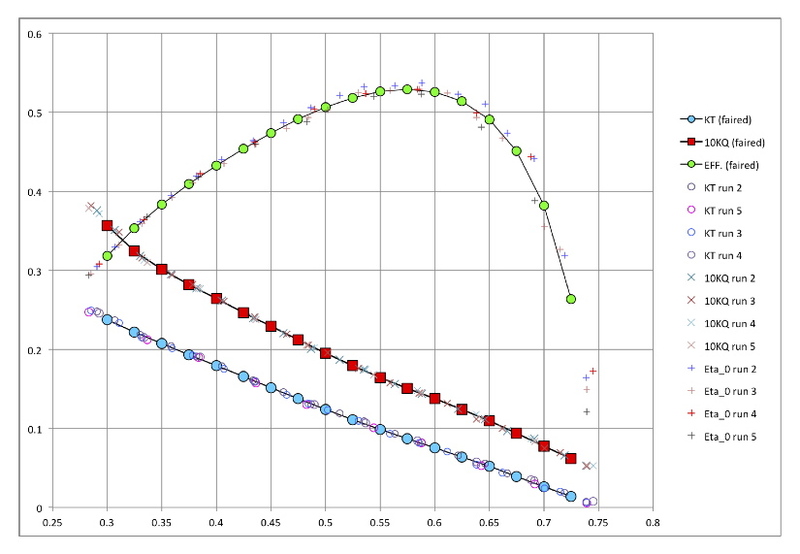 To demonstrate the skew symmetry the 3 rd (green)) and 4th (red)) data (180 – 360˚ ) have been modified and overlaid. Maximum efficiency of the Mark II Axiom propeller was measured at 53 % ; this was obtained during the first quadrant / open water test. Bearing in mind the differences in the P/D, BAR and outline shapes, the Mark II propeller can provide 63%% more efficiency over the Mark I propeller under similar conditions. The multi - quadrant data of the Axiom propeller reflected the symmetric feature of this propeller . The ahead and astern (thrust and torque)) performance of the Mark II propeller was shown to have skew symmetry requiring only 2 quadrants to be tested . In the first quadrant , the main cavitation patterns were a strong steady tip vortex and leading edge sheet cavitation at the suction (back) side of the blades . The extent and interaction of these cavities increased with reduced J value . The mid chord sheet cavitation was potentially erosive however the design point for this propeller is well away from the cavitation condition. The Mark II Axiom propeller with the new tapered outline shape would benefit from the inclusion of a duct to suppress cavitation and increase performance further. However Table 7 shows that the new design for the vessel and condition shown, doesn't operate in a cavitation zone with a free stream cavitation number of 53 at the given design point.